Early-1860s, 6th plate ambrotype of a casually posed young man wearing a naval cap that has hand painted gold highlights. He's also wearing a painted gold ring and smoking a cigar. Comes in its original case. Ambrotype is in very good antique condition behind original mat and glass. Some of the backing paint on the back of the glass is flaking, which is common and not damage. Case is complete with a taped spine. 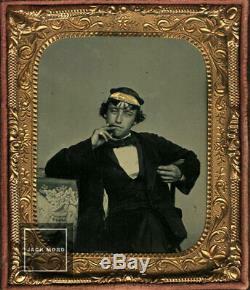 The item "Great 1/6 Ambrotype Photo Casual Cigar Smoking Navy Man / Civil War Era / 1860s" is in sale since Saturday, April 13, 2019. This item is in the category "Collectibles\Photographic Images\Vintage & Antique (Pre-1940)\Ambrotypes". The seller is "jack_mord" and is located in Woodinville, Washington. This item can be shipped worldwide.